The Madrassa is close in proximity to The Bahia and Badi Palaces, the Jewish quarter and a 7 minute walk the Place Jemaa El Fna main square. The riad comprises seven dormitories all with balcony’s overlooking a central courtyard with a sublime lemon tree as its centre piece. The upper terrace has stunning views of Palais Moulay Idriss and the roof tops of the Medina. Toilet and shower amenities are located on all levels of the hostel, laundry service and towel hire are also available. A free homemade breakfast is also offered featuring local Moroccan specialties. The Madrassa wanted to create an economical and socially responsible property, more than just simple accommodation for travelers; it is a place of experimentation into sustainable development, as well as a place for artists and culture to thrive. 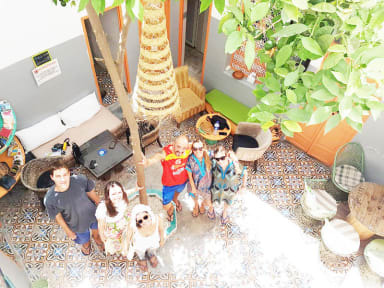 It's a great hostel designed in a Moroccan traditional way with an orange tree in the middle. The beds are comfortable and clean. For sure I will be back to this hostel!